Activates water molecules in your body and Improve oxygen level in your body! 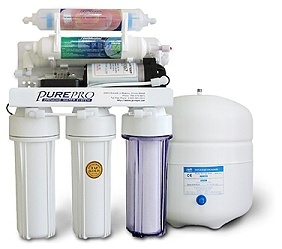 This revolutionary new PurePro 6 stage system uses Reverse Osmosis, Infra-Red Filter and Carbon Filtration to put refreshing, clean water at your fingertips. No other system available anywhere can give you all three kinds of purification in a system that is so simple. Warming and eliminating fats, chemicals and toxins from our blood and thus smoothening the flow of blood. PurePro number one quality you can always count on ! Since we introduced the EC Series to our customers, the respond has been incredible success. EC106P provides safe, pure water using reverse osmosis technology. We don't know of any other system at our price that can approaches its performance. EC106R-P comes complete with a NSF certified 3.2 gallons water storage tank, USA made membrane and all the necessary fittings, installation kits, extra color 1/4" tubing, and a long-reach chrome faucet. 3.2 Gallons NSF Standards Water Storage Tank. FDA Approved Polypropylene Made Flat Cap Housing (double o'ring). A thin film composite (TFC) high quality membrane that processes 50 gallons per day. It remove the following hard water contaminants that may be present in your water: lead, cooper, barium, chromium, mercury, sodium, cadmium, fluoride, nitrite, nitrate, and selenium. This Infra-Red filter can activates water molecules in our body and improves oxygen level in our body. Warming and eliminating fats, chemicals and toxins from our blood and thus smoothening the flow of blood. With a transformer, available in 110Volt, 220Volt or 240Volt (50/60Hz).